On July 4, 1776, the thirteen colonies claimed their independence from England, an event which eventually led to the formation of the United States. 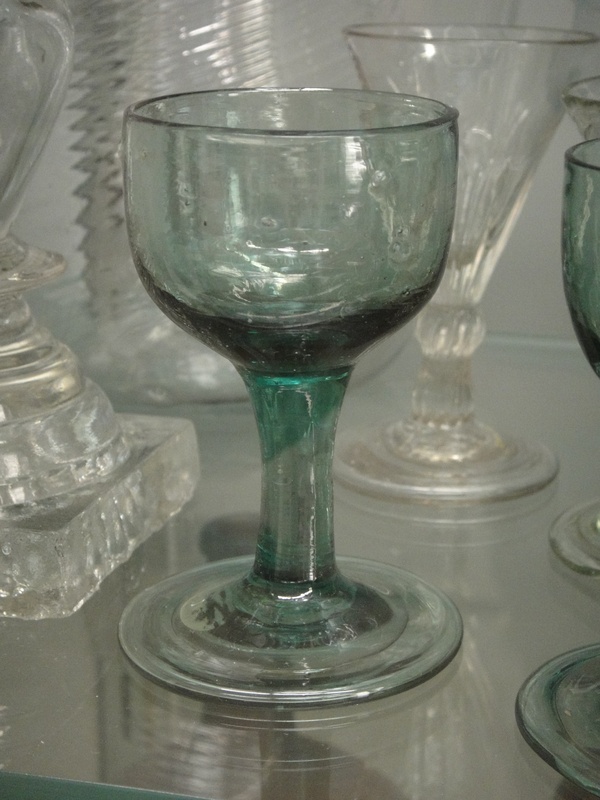 What was the most common type of glass bottle in the colonies at that time ? This is a dark olive green American chestnut bottle with pushed-up base. Plain applied lip. This free blown American chestnut bottle is olive green with pushed-up base and plain applied lip. This light olive green American chestnut bottle has a high kick and plain applied lip. 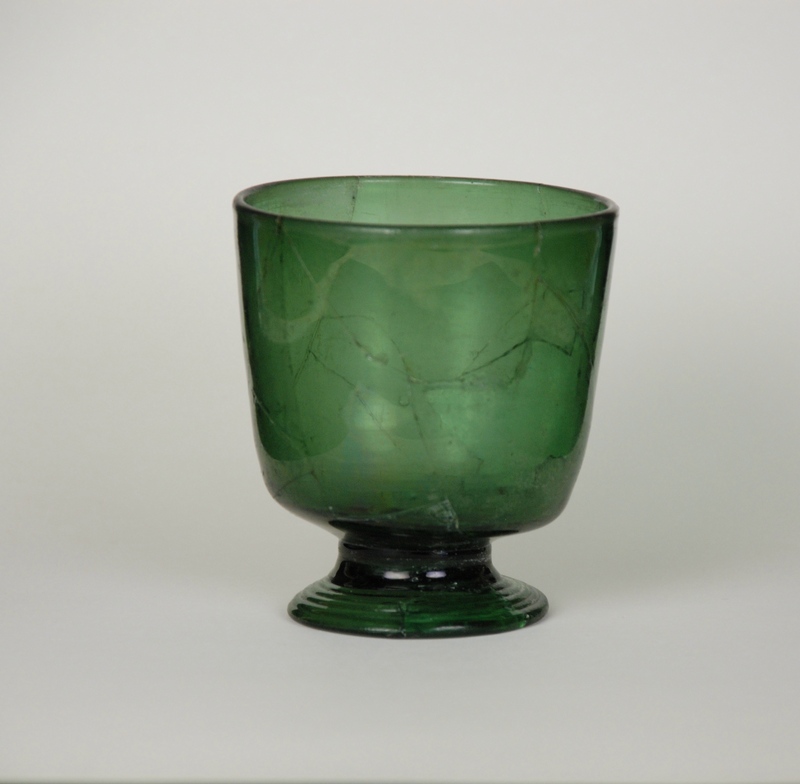 Pitkin Flask: Small bottle of green glass in an ovoid and flattened shape made by the “Half-Post Method”. In this method a gather of glass called a post is put back in the POT and a second gather is put on it so it covers about half of the post. It is then put in a vertical ribbed pattern mold and partly expanded and removed from the mold then swirled right or left. Also there are types in which the ribs are left it the vertical position. In the case of the popcorn Pitkin it is put in the mold a second time vertical ribs are put over swirled ribs call a broken swirl double pattern. Then the flask is expanded to the ovoid and flattened shape. Originally these flasks were made in The Pitkin Glass Works in Manchester,CT (1788-1830).They were made later in other parts of New England and in the Midwest (e. g. Zanesville, Ohio 1810-1830).Today they are classified as being New England Pitkins or Midwestern Pitkins. You can usually tell the difference by counting the ribs. The New England is 36 ribs and Midwestern 16 ribs. In addition to various shades of green they can be found in amber, blue (rare), amethyst (rare) and colorless glass. The flask came in two main sizes half pint and pint, used as a pocket flask for whiskey. This cobalt blue salt was made by blowing the glass into a diamond mold pattern, then expanded and shaped. This beautiful creamer is made of colorless leaded glass and has a pattern-molded body with 15 ribs. Its shape is typically Mid-western probably Pittsburgh . 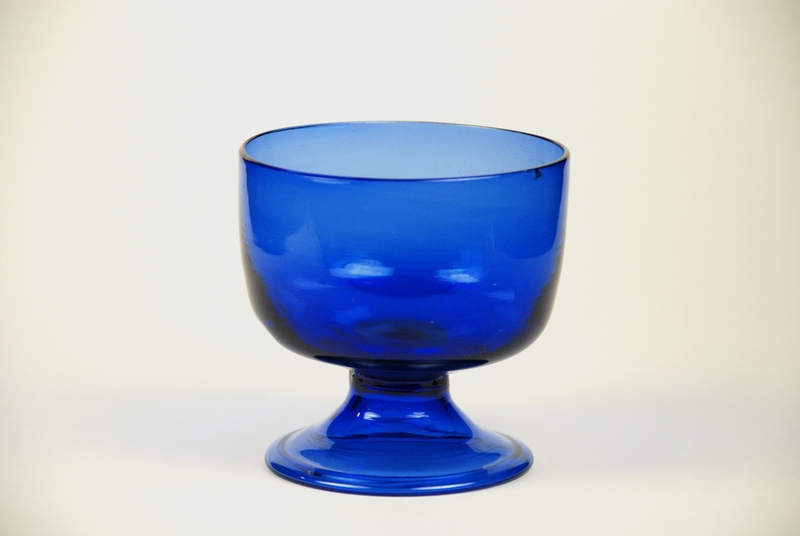 This is an American cobalt blue glass footed bowl. The beauty of this glass bowl is in the rich cobalt blue color and clean lines of its shape. 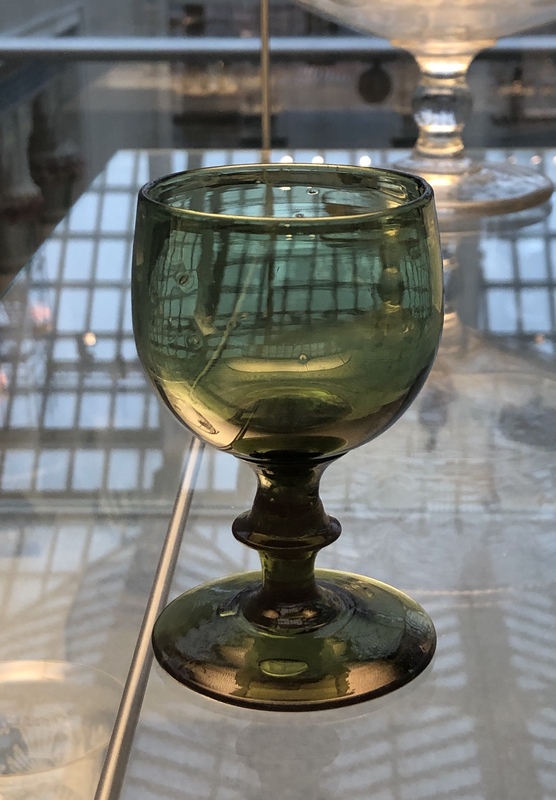 This American bowl (1780-1800) is very similar in style and shape to a dark green wald glass beaker (1500-1550) and points to how art repeats itself time after time. This poison bottle is in the shape of a half pint Pitkin made using the half post method. Unlike some poison bottles it is made of colorless glass and has no embossed words on it. The only distinguish characteristic that makes it a poison bottle is the hobnail pattern. 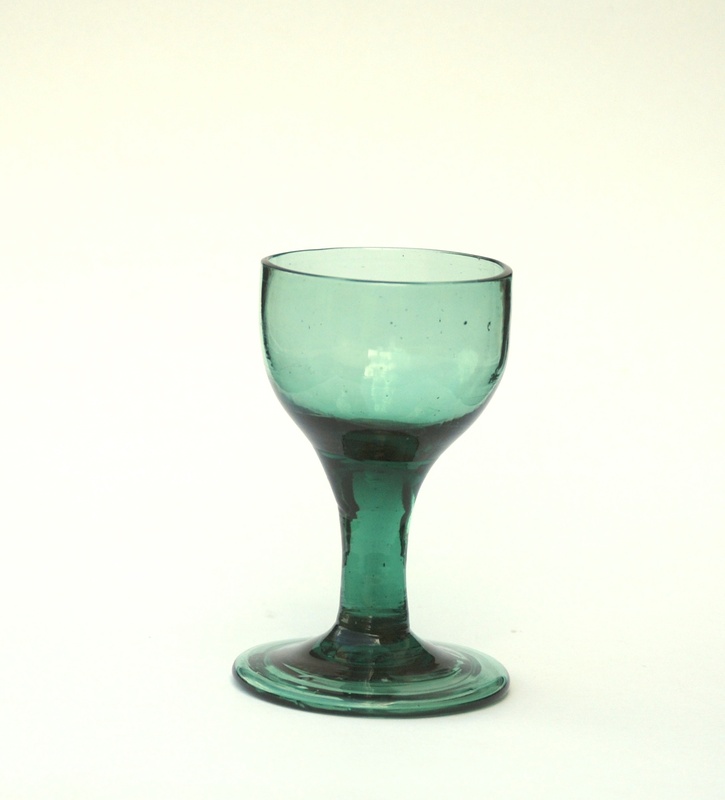 Green enameled glass bottle with screw top and cap. 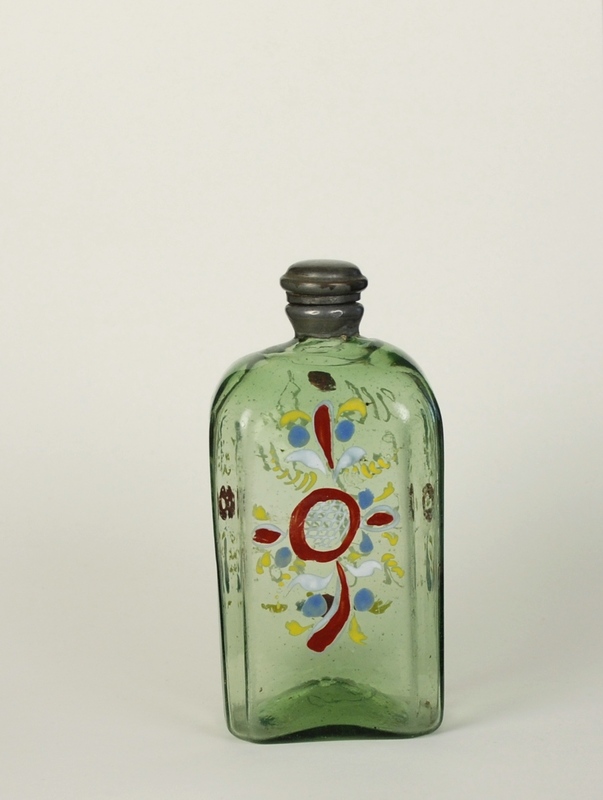 Enameled bottles of this type were produced in Bohemia, Germany and later in the US. The half post method was used for production.